It's not the cat's meow when Fluffy loses her voice. If Fluffy wakes you up at midnight with meows for attention, you might sometimes wish she'd lose her voice. But if your cat's normal meow changes to a hoarse squeak or fades out altogether, it's time for a trip to the vet to determine the cause. Just like you, Fluffy can catch an upper respiratory infection (URI) that leads to laryngitis, causing hoarseness. The most common viruses that cause URIs in cats are herpes (NOT the same strain that infects humans) and feline calicivirus. Common symptoms of URIs in cats include runny nose, tearing eyes, sneezing and possible sore throat and laryngitis. If Fluffy is eating and acting normally, your vet probably will recommend just keeping an eye on her. If she stops eating, is lethargic, has yellow or green discharge from her eyes or nose or just doesn't seem to be herself, your vet may prescribe antibiotics or other medications. Cats sometimes develop growths on their vocal cords or other areas of the throat. Symptoms include hoarseness, changed vocal sound or even a complete loss of Fluffy's meow. Cats do get throat cancer, but also are prone to benign tumors and vocal cord polyps. Other symptoms of growths in the throat are sneezing, coughing and persistent ear infections. To diagnose or biopsy a growth causing hoarseness, your vet will need to anesthetize Fluffy and thoroughly examine her mouth, throat and trachea. Treatment might require surgery or medications. Though it's far more common in dogs, cats can develop a condition called laryngeal paralysis. Nerve damage causes the larynx—or voice box—to stop working properly during breathing or meowing. Along with hoarseness or loss of voice, your cat may cough, lose weight, have difficulty eating and struggle for breath. Laryngeal paralysis is very serious, so any cat showing symptoms of this condition needs to see the vet right away. Treatment is usually surgery to permanently open one side of the larynx, allowing the cat to breathe normally. Cats with hyperthyroidism often have a hoarse meow along with weight loss. Your vet can check Fluffy's blood for this disorder. Rabies also causes hoarseness, so take your cat to the vet if there is any chance she was near a rabid animal. A prolonged bout of meowing can also cause hoarseness. Often feline laryngitis has no clear cause, and Fluffy will regain her meow with no treatment beyond time. Can Cats Become Hoarse From Constant Meowing? 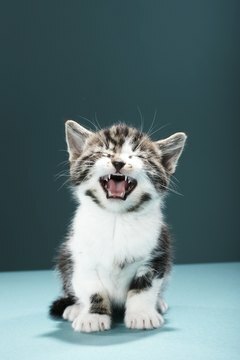 What Makes Your Kitten Lose Its Voice?